Take a look into four billion years ago. Not a bad view, for 4 billion years ago. 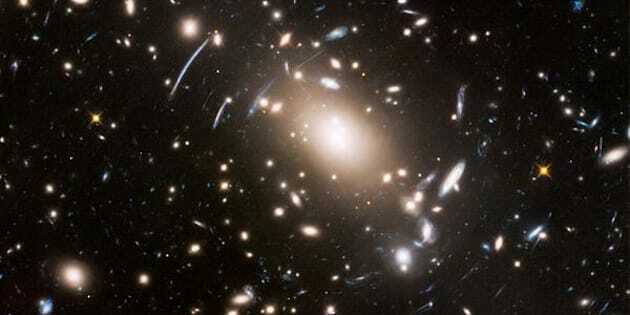 The image above shows the galaxy cluster Abell S1063, which is “potentially home to billions of strange new worlds” according to scientists working with the Hubble Space Telescope. Visible near the center of the image, the cluster appears as it was four billion years ago. The photograph, released on Thursday, was NASA’s astronomy picture of the day Friday. While the Hubble Telescope is extremely powerful in its own right, this view is made even more impressive by a natural phenomenon called gravitation lensing. These conditions allow the observation of galaxies much older than Abell S1063. For instance, one of the galaxies behind it is approximately 12.7 billion years old, according to Space.com. Another view from Hubble observed in parallel with Abell S1063.